Sorry for the dearth of updates this week. Charleston has definitely been keeping me on my toes and I was staying at a Couch Surfer’s (awesome dude by the name of Lee) house outside the city so there wasn’t much quality time with Charley. First, a question: How come history gets so much more interesting as you get older? Is it just because you have more personal history than you used to? All I know is “History” was one of those classes I always DREADED going to but (and maybe it’s just because I get to see these things live and in person, but I don’t think so) wandering around Charleston has been awesome and I LOVED seeing the Fort Sumter exhibit and Battery Park. Mind blowing. On a more personally historic note…#19 is off the list! Ka-KOW!!! While in Charleston I made a day trip out to Boone Hall, the most photographed plantation in America (for obvious reasons once you get there), with Angie, one of Lee’s friends and my private tour guide for the weekend. I know the list says, “Help out on a plantation” but if I’m being completely honest the amount of help I actually offered is probably dubious at best. I had emailed the plantation previously but hadn’t heard any word back from them and since I have to be up in New York next weekend for sailing lessons courtesy of the Atlantic Yacht Club I didn’t have time to wait around. It wasn’t a very auspicious start to the day when we pulled up to the gate and explained my situation only to be told that we couldn’t even get on the property to talk to someone without paying $17.50. I don’t know what your definition of “shoestring budget” is but mine sure as hell doesn’t include the wanton spending of twenty bucks in the HOPES that I might get to cross something off the list. While traipsing through an irrigated field on the portion of the 700 acres of Boone Hall that is still farmed we ran across a truckload of laborers picking cucumbers. With the confidence and aplomb that often deceives people into believing I know what I’m doing (or at least am supposed to be where ever I happen to be) I marched up to the truck and offered my services. “Oh! Um…Me ayudo? Wait! No! Crap…that’s not right…” Eight farm workers exchange confused glances at each other while I stumble through forgotten Spanish in my head. “Yo quiero ayudar.” I pull out a broad grin and hope for the best. One of them smiles, taking pity on me. “Necessitas decir a el,” she points to the white truck driving towards us and not wanting to get kicked off the property before I’ve even seen the plantation proper I beat feet in the other direction after thanking them for their time. The rest of the day brought with it a pretty thorough exploration of the plantation property and I’ve got to say I was pretty impressed. If it weren’t for the severe deficiency of funds I think I would have gotten my money’s worth even if I had dropped the $17.50. I learned a fair amount. Always good. Saw some very cool things. Tried to help the lady in the butterfly house. Kind of failed at helping an injured butterfly with a piece of duct tape. Offered my services in the “Hospitality and Information” building where the lady in charge was neither hospitable nor informative. I suppose I was less than helpful there too. I tried to help feed the horses but they didn’t seem to enjoy the balsamic vinaigrette I put on their salad. But the old man performing the period hymns seemed to like having me help out on percussion. I swung back through the cucumbers on my way out and managed to help pick a few (…but the laborers were gone by then and I didn’t know what to do with them so I just put them in my pocket). AND, look at all the free advertising they’re getting this week. I’d say that’s mission accomplished and a firm “win, win.” What do you say? 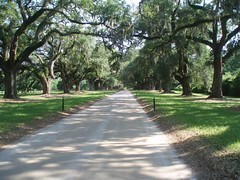 More Boone Hall pictures here. If you want to help me get by on more than just aplomb…why not donate? That house is exactly what I expected to see for a plantation, weird. Brett! Did you actually get to go out to fort Sumpter!? I’ve actually been there! 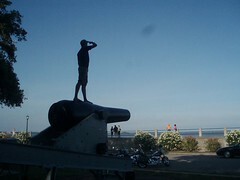 You can still see the actual cannon balls that broke through the fort’s outer walls! If you get the chance since you’re in the area you should head up to North Carolina and check out Kittyhawk where the Wright brothers flew, and also Roanoke the lost colony. Both amazingly awesome historical sites worth your while, and might top the TASTHIB list. 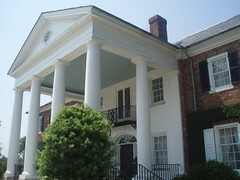 I’ve been to Boone Hall Plantation!! It’s sooo purty! @Jess: Minus the “Hospitality” lady pretty much everyone has been friendly. And it IS a much cooler state than I originally expected. Go check it out. Is that a pocket full of stolen cucumbers or are you just happy to see me? I like that the field workers were confused as to why in the hell you would want to help. for free. breaking and entering to do volunteer work. Now that’d be a good reason to have a warrant! That house is exactly what I expected to see for a plantation.